Vea lo mejor de Bali en esta excursión privada en tierra con un conductor. Descubra una variedad de atracciones balinesas durante su estadía en el puerto, desde un templo hasta una cascada, desde exuberantes campos de arroz hasta café luwak. Además, echa un vistazo a la escena de artesanía local en la popular zona de Ubud. Disfrute de una experiencia personalizada con un tour privado, que incluye transporte de ida y vuelta desde su puerto. Excursión privada a la costa de Bali. Admira el paisaje de los arrozales verdes. Su tour privado de un día a Bali comienza con la recogida en la terminal de cruceros de Benoa después de que atracan los barcos. Con su conductor privado, diríjase a su primera parada, un templo hindú ubicado en el campo de Batuan. Admire la ornamentación del templo, que es mantenido por los residentes locales, antes de continuar a la cascada Tegenungan de 50 pies de altura (una de las pocas cascadas en Bali que no se encuentra en las montañas o tierras altas). Disfrute del entorno exuberante y el flujo de agua abundante, y vaya a nadar, si lo desea (debe pagar el seguro para hacerlo). Pase por los arrozales de Tegalalang, que incluyen subak, un sistema de riego cooperativo tradicional balinés. 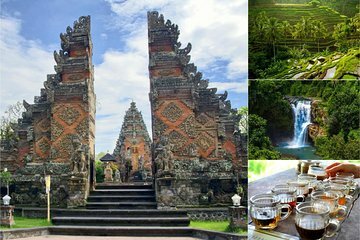 Disfrute de la vista de las terrazas verdes inclinadas, y luego diríjase a una plantación de café, cacao y té cerca de Ubud, donde aprenderá sobre el café luwak, el famoso café de Bali hecho con bayas de café que han sido consumidas, parcialmente digeridas y liberadas por el La palmera asiática, un animal nativo. Los granos de café aún intactos son recolectados por los agricultores y limpiados y tostados. En la plantación, aprenda sobre este proceso y disfrute de una degustación de café, té y bebidas de cacao (se puede comprar café luwak, si quiere probarlo). Luego, diríjase a los pueblos alrededor de Ubud, una ciudad popular por su escena artística y su ambiente tranquilo. Aprende sobre la pintura balinesa y otro arte producido aquí mientras visitas Mas, un pueblo dedicado a la talla de madera, Tohpati, un pueblo conocido por el tejido de batik, y Celuk, un pueblo famoso por sus joyas de oro y plata. Mira a los artistas en el trabajo y admira las cosas hermosas que están creando. Su excursión en tierra termina con el regreso a la terminal de cruceros para la salida de su barco. Aseguraremos su regreso oportuno al puerto de Bali Benoa para esta actividad. En el raro caso de que su barco haya partido, coordinaremos el transporte al siguiente puerto de escala. Si su barco se retrasa y no puede asistir a esta actividad, su dinero será reembolsado. Vea nuestros términos y condiciones para más detalles. He spoke good english and was very polite. We visited traditional workshops and sights and can highly recommend this trip, our guide Luhur and his company. Excellent value and very accomodating guide. He was able to give various options as we were concerned about making it back to boat on time, owing to tendering.we were really pleased there were only two of us on the trip. We enjoyed the sacred monkey forest, which we went on his recommendation. It was good to get out in the green countryside, away from the traffic of the towns. Our driver/guide was a very pleasant young man with poor English. Our time was very limited a we visited very few locations. His recommendation for lunchhe got a free meal from the restaurant....was excellent. Overall it was the best way to get a taste of Bali. Unlike other tours with Viator, this was not as good. Itinerary was good but the places we were taken were not unique but touristy with large numbers of big buses and crowds. The shops were tourist traps and not at all unique. We stayed in town and the coffee plantation was a neighborhood little garden. For the 2 of us and the driver, I expected to go to better examples of Batik and silver shops. I feel we were taken to his friends businesses. Even finishing about 2 hours earlier, nothing was offered to show us more of this culture. He also was on his phone a bit more than I feel was polite when working. Oka from Bali Sun Tours was our driver for the day and he was waiting for us when our cruise ship docked. We discussed what we wanted to see he took us to a wonderful wood carving place and a Batik shop where we got to see the cloth being made. We also went to a temple where we had to wear sarongs. While we were not too excited about the coffee operation he suggested we visit, we finally agreed. It was actually quite interesting and not like any coffee plantation we had ever seen or been to. We sampled many, many different types of tea and coffee and actually bought some for holiday gifts. As we are both seniors, my brother and I really just wanted to spend a couple of hours seeing some of the sights and not the entire day being out and about. Oka was very attentive and drove very well as we traversed the highways. It was interesting seeing the Balinese culture and also discussing many of the facts about the country and culture. Oka's command of English was excellent! All in all, the excursion was excellent and certainly offered more flexibility than the ship tours at a considerable cost savings! Absolutely excellent trip with Nyoman from Bali Sun Tours - as we left the ship he was ready and waiting to meet us at the port gate. He was so knowledgable and friendly, explaining all about his culture and life in Bali and pointed out so many interesting places on route. Firstly we went to a wonderful Hindu temple not visited by the large tour buses, then on to the Tegenungan waterfall, walked through the Tegalalang rice fields, then the monkey forest, as we had already been to a coffee plantation we actually skipped this part of the tour. Lastly we visited Ubud before returning to the ship. This tour is excellent value for money, would thoroughly recommend to any cruise passenger. When we had got ashore, we were met at the dockside by our friendly guide. After a brief discussion on what it was possible to see in one day, we decided to follow the guides pre-planned itinery. We first went to the easy-to-remember Pura Desa Adat Cila Murti Batuan temple, which was very grand and impressive, with attractive gardens. The only down side was having to wear a matching sarong with my wife. Next we went to the waterfall at Tegenungan, which again was very impressive, although hard work if you wanted to walk down to get a closer look, and then back up the steep hill. On then to the rice terraces at Tegalalang, where the workers were out in the fields, and some even posing for photographs. The scenery was beautiful, and nearby were numerous shops and cafes. We then drove through Ubud, where you could see mile upon mile of shops selling stone and wooden carvings. We turned down the offer of visiting a wood carvers, and instead carried on to a coffee plantation. Here we had an explanation of how coffee beans are farmed, and then tried samples of various coffees, teas and cocoas. We then went to a Gold and silver Jewellery factory, with an explanation of how it is made. We were then ahead of schedule for our return to the cruise ship, so we then spent an hour or so at the beach resort of Sanur. Here was a long golden sandy beach, with numerous bars and markets stalls along the promenade. Our driver was excellent throughout, giving explanations and offering advice, as well as stopping for us to take photos., or get a drink. The whole trip was an excellent insight into the culture and Bali way of life, as well as seeing some of the islands natural beauty. Good private tour of Bali. The driver's commentary was good but a little difficult to understand. We enjoyed the tour.